• Preserve book values. Amortize current balances over remaining term. • Allocate expense for selected records to multiple cost center accounts. 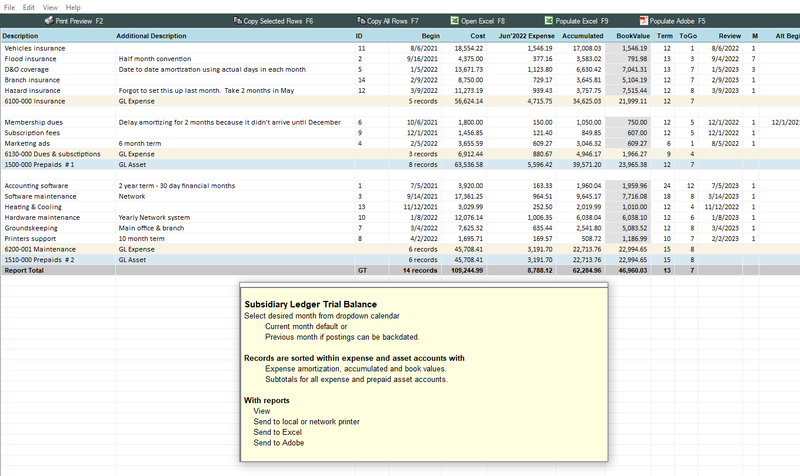 • Monthly journal entries formatted to update any general ledger system. Convert one or more worksheets to the software in a matter of minutes. Or keep using your files and import them for monthly processing. Simple zip file. Nothing to install. Download now. No registration required. Demo is the actual software and can be "rolled" into a permanent system. Add some of your records. Preserve current book values. Run administrative and other reports, too. Allocate amortized expense to, say, Regions based upon assigned percentages %, sales volume $, employee count or other user defined method. This allocation will assign the results to, say, Offices. Region results can then be allocated to Offices within each Region using the same or different user defined method which also assigns a general ledger cost center to the account number. Distribute and post amortization to multiple expense accounts, branches, cost centers. Import a file from another source. Allocate using one or multiple user defined methods. 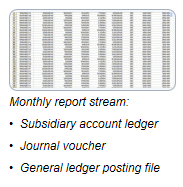 Create journal entry postings for any general ledger system. Import and allocate other amounts, too. Need to allocate amounts from another system? From your general ledger? Import other amounts in an Excel file into the software. Allocate using one or more of your distribution methods. Prepare all accounting and audit reports. Special type of records? Amortization? Allocation? Reporting? We offer custom coding services. Enter client records to the software or import entire file from Excel. Run monthly amortization and balancing reports. Known and unknown amounts. Change anticipated to actual when known. A great way to track and expense prepaid inventory cost AND count! Rerun any report from any prior month or prior year on demand. Use the software's Import capabilities and convert a file yourself. Or, some clients had us do the conversion at no charge and save them time. Many of our clients use both Excel and our software. Simply import entire file to the software each month. Run all monthly amortization reports. 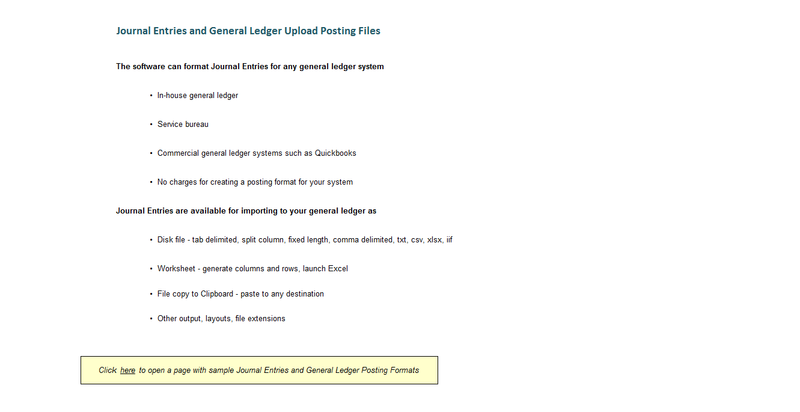 Create a general ledger posting file. Format and Document External Postings, too! The software includes a stand-alone program to format postings from external sources. Download the free demo right now to get a feel for how the software operates. The demo is the live software and can be rolled into a permanent system. We also offer other versions of the software. and we'll let you know whether or not they can be met. • Send reports to screen, local or network printer, Adobe. Export to Excel. • Find a big mistake? Forgot to enter some records? Simply fix the problem and rerun the reports. Already updated the general ledger? Then fix the problem and rerun monthly reports. Any month. Range of months. Entire year. Records are normally edited one at a time using the software's setup/edit screen. 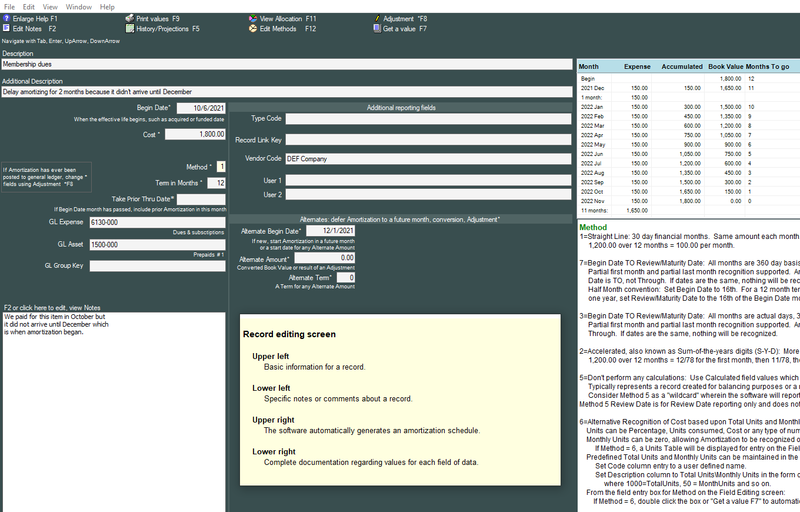 Among other features, the editing screen performs data value testing and produces an immediate amortization schedule. 1) Copy the master file to a spreadsheet, such as Excel. 2) Edit records using all of the spreadsheet functions, such as fill down. You can can also add and delete records. 3) Copy records from the spreadsheet and paste back to/as the revised master file. "Thank you so much for your help. It’s so refreshing to talk to someone who understands!" "We have been using your software for some time. This system has always been so easy to utilize and we really appreciate the level of detail in the reports." 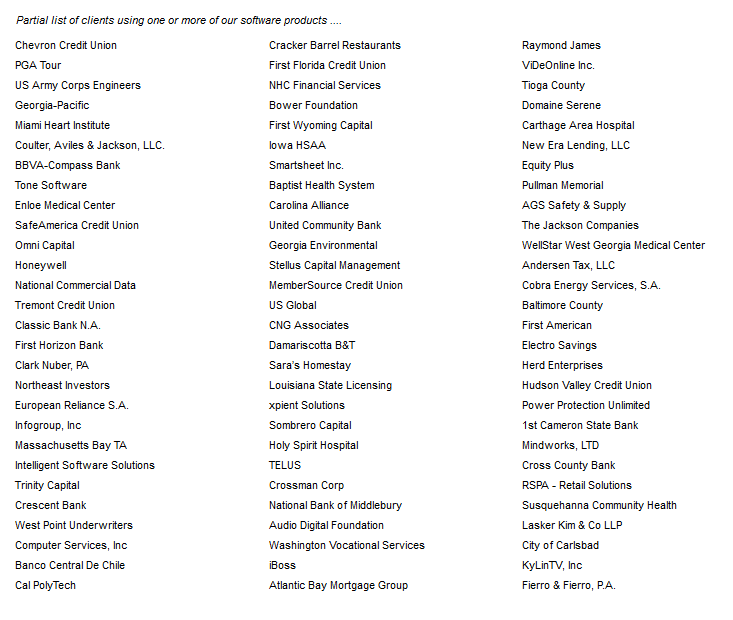 • The software can "break apart" account numbers and place specific portions into different columns. 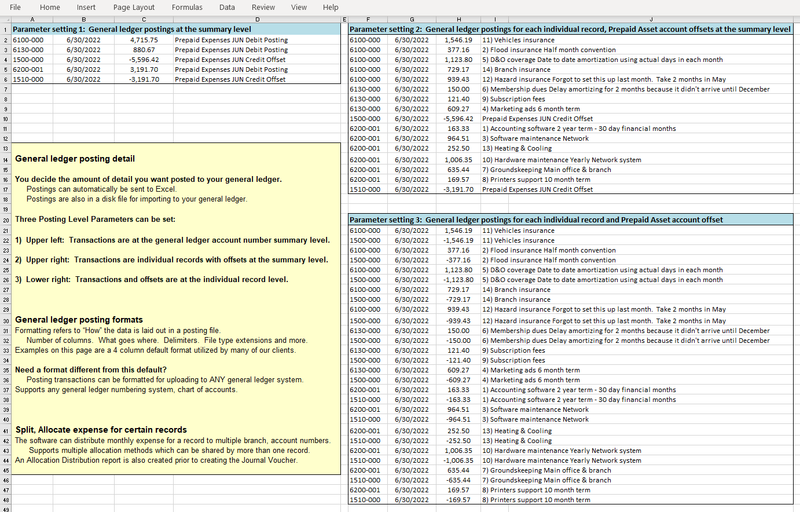 Branch, department, cost center count wherein each receives the same expense portion. Create a single record for an expense to be distributed among branches. If 5 branches, each receives 1/5 of monthly amortized expense. Participating branch, department, cost centers wherein only some receive a portion. Percentage. Assign varying percentages to be allocated to each. Square feet, such as allocating to departments based upon space occupied. Employee count, wherein allocation is assigned based upon number of employees. Workstation count, allowing IT expenses to be allocated based upon assigned equipment. Other user defined allocation methods. • A branch, department or cost center can be located anywhere within your account number. • Assign an allocation method within the expense account number at the record level. An allocation method can be assigned to multiple records. • The software replaces a method with as many branch, department, cost centers assigned to the method. Automatically create the annual schedule utilized by your CPA auditor in a matter of seconds. Export to Excel. Example: Create a monthly report containing new records with cost greater than $2,000.00. Or Terms greater than 12 months. Calculate expense and balances for a month or multiple months. Export to Excel for internal/external purposes. • The system can distribute amortization expense for selected records to multiple branch, cost center accounts. • The Allocation Report provides a detailed listing as to exactly how expense for each was distributed. • Amortized expense, book values and totals. Any month. Any year. Any period. • Calculate expense amortization and book values for multiple months, an entire year. Display monthly expense in a single column or multiple, month by month columns. No need for any adjusting journal entries. Calculate prior and current book values. The software can amortize costs from original dates. Begin amortizing from an "as of" date. Typically the beginning of a calendar or fiscal year using prior EOY balances. Enter records directly into the software. An easy to use setup screen and documentation guide you. View an instant amortization schedule verifying what was entered. Import one or more worksheets as a conversion to the software. Always import all records from an Excel worksheet. Import to the software at any time for monthly amortization and reporting. Enter records to the software. Import new records from Excel. • Client records - Maintain or import client records from Excel. Amortize records and provide a monthly set of reports in Adobe or Excel. "We have been using your software for some time. This system has always been so easy to utilize and we really appreciate the level of detail in the reports." The software can be modified to meet the needs of a specific client. An easy process to use whenever you want to clear out old records. • Sort records by current Book Value. • Records with a 0.00 Book Value will be at the top of the listing. • Select some or all with a Book Value of 0.00. • Selected records will be deleted in a single step. Let's say you just added a bunch of new records. Are you in balance with your general ledger? • Select totals by Prepaid Asset Accounts. • Old records: Book Value will be as of prior month end. • New records: Book Value will be Cost. • The system will combine both into a single Total amount. • Each Prepaid Asset Account Total on the report should tie to the general ledger. Generate an amortization report as of any month. • Select all records or use filters to limit which should appear on the report. • Generate subtotals for up to five (5) different values. • The report can include records or, for a shorter report, subtotal rows only. • Select all records with a Begin Date on or after the 1st of the year. • Sort records by Begin Month. • Obtain Cost subtotals for each month. • Select all records with a remaining Book Value greater than $5,000.00. • Sort records by Prepaid Asset account. • Obtain Book Value subtotals for each Prepaid Asset account. Perhaps a My Subtotals Report (above) has to be sent to someone who requested it. • Click a single icon to populate a worksheet. then opens an Excel file with the formatted worksheet and data. • Save the Excel file under any assigned name. • If applicable, send the Excel file attached to an email. Try a free demo, also available on the price page. This is just a quick note to let you know that the software is up and running. More importantly, we love the software! Thank you so much for your help and we look forward to working with your company in the future. Thanks for your help today. We imported all of our records and current balances without a problem. Your software is as advertised and will be most useful. We have been using your software for some time. This system has always been so easy to utilize and we really appreciate the level of detail in the reports. It’s so refreshing to talk to someone who understands! We just installed your software last month. The software has already saved me hours for forecasting models. Your customer service is fantastic! Determine all changes to general ledger accounts for a month. For entire audit year. Copy all reports to Excel. Copy all records or filtered (selected) records to Excel. List, sort, export and more. Nothing else is required to manage your data records. Additionally, the software can import data from Excel and other spreadsheet files. Importing allows you to add records from another source to the software. Import dozens, hundreds, even thousands of records. Import on an ongoing basis. Add new records from a file that was created at another source. The software verifies data values are of a correct format and lists any conflicts or errors. And automatically calculates a maturity/review/tickler file reporting date. Current accumulated and book value for existing records can be preserved or calculated by the system. 1) Copy an entire worksheet or highlight and select desired rows. 2) Click the Paste icon on the software's Import screen. An Import Table maintains worksheet Column Letter cell values. An option switch allows you to replace all existing records or add (append) new records. The "Copy from" source can be an Excel worksheet, other spreadsheet program or any tab-delimited file. • Enter descriptions into the software or copy/paste from another source. Report all records that will have a zero book value as of December 31st. Report all new records for the previous quarter with cost > $1,000.00. 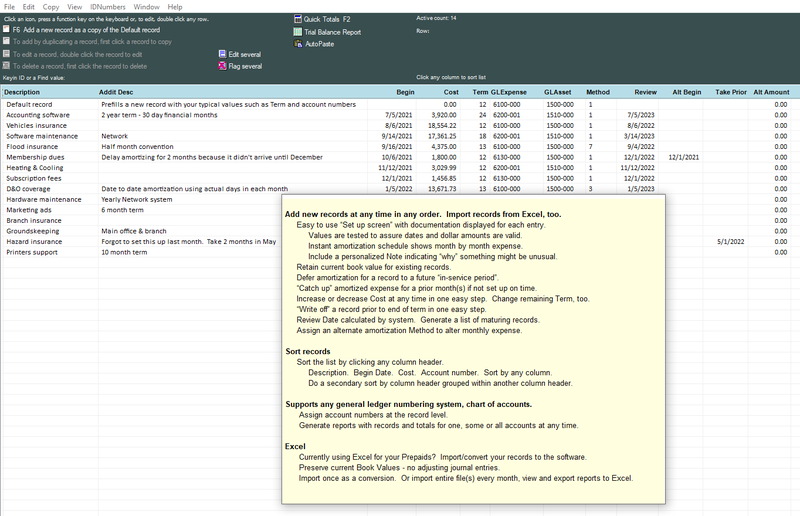 Report all records in three expense accounts, send report to Excel. Supports any chart of accounts. Monthly amortized expense for a record can be distributed to multiple expense accounts. The software can format transactions for posting to any general ledger system. Output to disk file, Excel worksheet, other. Multiple debit, credit columns or a single column with credits identified by "-" or "( )"
Increase or decrease the amount being amortized? The Adjustment Screen automatically handles additional payments and refunds. Add a record that should have been added last month? Prior month expense for a record can be included with the current month. Add a record that shouldn't begin amortizing right away? Defer amortizing to a future date? An alternate begin date defers amortizing to a future "in service" month. Change a term? Write off immediately? The Adjustment screen automatically handles these, too. Allocate expense to several branches or departments? The Allocation module distributes expense using one or more methods. Are you ever out of balance? The History Audit Report shows monthly changes to each general ledger account. Automatically created History archive files. • No more searching for old reports. • Recall any report for any month. • Export - copy an entire report to a worksheet. • History allows you to go paperless. All text changes plus monetary adjustments are maintained in activity logs. History tracks any changes made in Excel import files, too! Lifetime amortization schedules - past and projected - along with critical memo Notes. Recall prior monthly general ledger expense and offset account postings. History allows for reports to span multiple months. 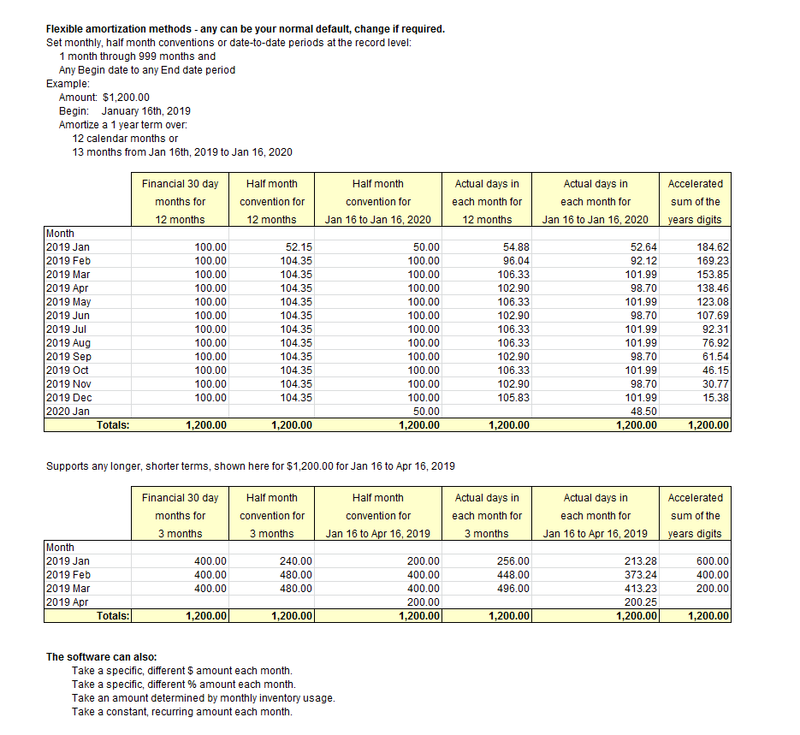 Copy 12 month fiscal year recap to a worksheet, email to your auditor. Reconcile your prepaid asset accounts. In seconds! Simply compare the Reconciliation Report to your general ledger asset account activity. Run the report for a single general ledger account or all accounts. Reconcile a single month or range of months. Reconcile an entire year - great when auditors want to see annual changes to your prepaid asset accounts. • Some entered their records directly to the software, doing a "clean up" as they went along. • Some imported and converted their records to the software from an Excel worksheet or other spreadsheet. from Excel worksheets created at branch sites. They began entering new records to the software and allowed existing records to finish amortizing the "old" way. They always import all of their existing plus newly added records to the software each month from Excel. The demo is the live software and any records added can be rolled into a permanent system. If desired, return the Excel template with two or three actual or sample records. We'll import, generate and return the same file with a set of monthly reports. Need something unique to your operation? You import an Excel worksheet(s) containing your records. The software can modify data values. Perform "if this, then that" routines. Export calculations and reports to Excel. Export all or filtered records meeting your selection criteria. Modify data values during the export process. Specific column headings and column order. Other requirements you may have. Compare balances and activity for one or more general ledger accounts over one or more months. Beginning balances. New additions. Amortization. Adjustments. Ending balances. Net activity. Provide detail activity from beginning of through end of calendar or fiscal year. Click. Click. All monthly reports with two mouse clicks! • No close out required. Discover an error afterward? Merely fix and rerun. 1) Enter them directly into the software using the Editing screen. Afterward, enter new records using the same screen. 2) Import Excel and other worksheet conversion data. Continue importing new records, too. Send us a file and we'll convert your records. Prior calculations Preserve current Book Value and Accumulated. Or the software can recalculate everything in a consistent manner from the original date. 1) Most converted their spreadsheet records and now utilize the Editing screen. 2) Some maintain all records in a spreadsheet and always import their entire file. Files created at branch sites. Sent from their Accounts Payable (A/P) department. Even if you inherited a junker file, your existing records can be converted to the software. Unique data conversion values can be incorporated, too. Be up and running with a solid system today! Copy any report and paste to a worksheet. Other calculated values "as of" any month. Use report filters to selectively choose and generate desired subtotals. All months have 30 days. Amortize an item evenly over 1 thru 999 months. Amortize an item for the actual date to date "in-service" days. Recognize greater amounts during earlier months, gradually taper down. • Enter records, edit records within the software. Unique option to convert worksheet records or always import and generate reports on demand. • View, print, export reports. • Direct post to general ledger accounts. Allocate selected records to multiple centers. • Upload posting file for any general ledger system. The software builds a posting file conforming to any column format, any file layout. Undo reversal. Backdate entries to a prior month. 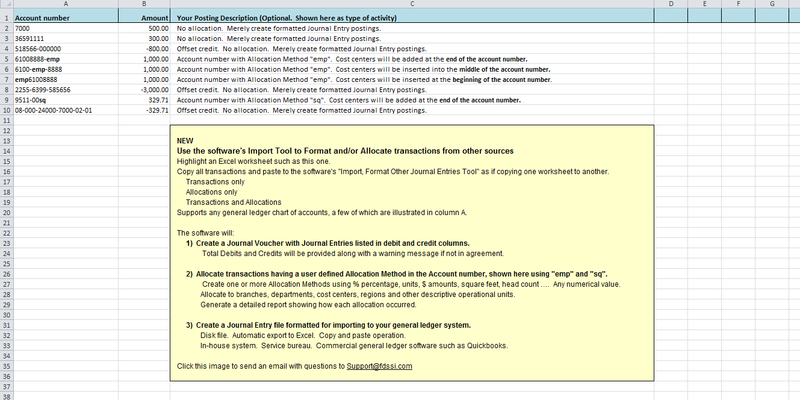 - Enter, edit, add your accounting records to the software database using an input screen. • Immediate amortization schedule helps verify correct entry. • Documentation, screen Tips, dupe function, rollover/renew ability, posting history. • Notes. Log reasons for changing and other critical information regarding a specific record. - Defer - Postpone amortization to a future "in service" month. - Catch up - Include prior month(s) amortized expense in current month when setup was late. change to remaining term or immediate write off. - Your existing records - Retain current balance for existing records or the software can calculate from each begin date. Generally, monthly amortization is posted directly to a general ledger expense account. Branch, department, RC, cost center accounts. - Same percentage to each cost center (evenly). - A specific fixed percentage. Workstation count, employee count, department square feet, revenue stream, asset dollars, more. - Which centers are to participate in an allocation Method. - Virtually any number of different Methods for any purpose that can be expressed numerically. - Merely substitute the cost center portion of a general ledger account number with a Method. Cost center identifiers can be of any length. They can be located at the beginning, middle or end of an account number. - A Method can even be shared among records having different base account numbers. The system creates a report showing how each amount was allocated. • View and print reports for any prior month and year. Send reports to Excel. Email requested information to your CPA/auditor. Span fiscal year - display general ledger annual expense for each month. Monthly history files allow you to print reports only when necessary.